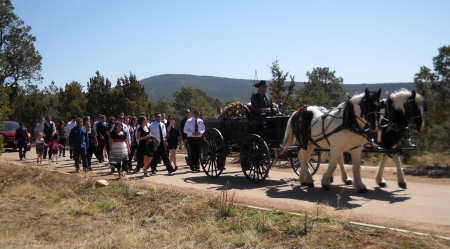 Bear Creek Adventures Horse drawn wagon and carriage rides for funerals. I didn’t think writing a small blurb would be so difficult to put into words. I wanted to capture the feelings of everyone, but that is impossible, so I’ll just concentrate on myself. The day Maria asked you for my family to provide the horse carriage for my daddy’s funeral you didn’t even hesitate, you right away asked where, when, what time! I cannot begin to express the gratitude my family has for you and the service you provided us. After the mass when the pallbearers were instructed to load my daddy’s casket onto the horse carriage instead of the limousine, emotions went into play. 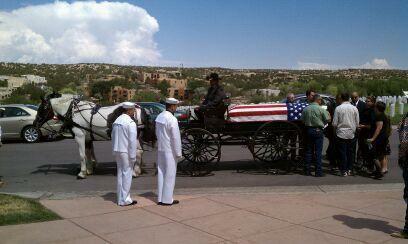 It was so appropriate to take "a real cowboy" to his resting place. Your beautiful horse carriage and horses were the lead. People decided just to walk behind you instead of driving to the cemetery. Still today, nine years later, people ask me who you were and who those horses belonged to! Thank you Eric from the bottom of my heart, you will always hold a special place in my family’s heart. God Bless You & Keep You & Your Family Safe!" Honor your loved one with a fitting tribute and a traditional last ride. In your time of sorrow what more fitting way to show your respect than the slow dignified procession that a horse drawn funeral vehicle can provide. Our mission is to not only provide a dignified service for your loved one, but to help your family through the grieving process. We welcome and encourage families to walk in the processional. We offer the coach seat for honored guests to ride with their loved one - if your loved one has a favorite dog or horse, you are welcome to lead them along as well. Typically we will carry the casket from the church or funeral home to the gravesite if it is within 1 1/2 to 2 miles. Don`t worry if the church is a long distance from the cemetery. We will work with your family and with your funeral director to choose a location along the route or at the cemetery gates to transfer the casket into our wagon. We have vehicles and horses to handle the deceased, or the entire family and guests. Because of the short time frame, we will work with you to simplify booking, payment and deposit arrangements, please call us as soon as possible. COST: $700.00 base plus $100.00 per hour after the first two hours, plus $4.00 per mile if over 25 miles from Pecos, plus tax.